(Boston, MA) — After obtaining a quick 2-0 series lead, the Cleveland Cavaliers (2-0) will hit the road to battle the Boston Celtics (0-2) at TD Garden in Game 3 of round one. Thursday night presents a huge opportunity for the Cavs, as they can hammer a nail in the coffin of the Celtics’ playoff fate with a victory. 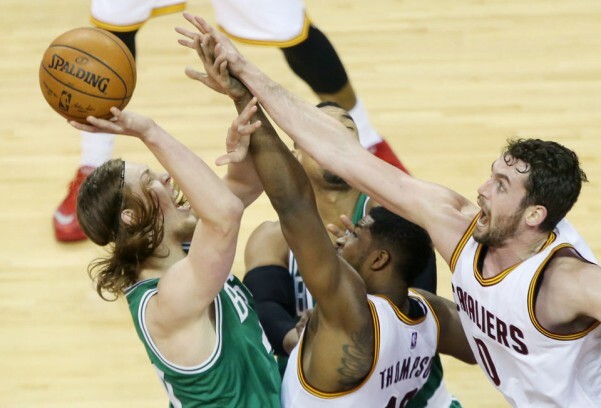 The Celtics continue to play the Cavs extremely tough, as Cleveland held off Boston for a 99-91 win on Tuesday night in Game 2. Cavs head coach David Blatt, who was born in Massachusetts and raised as a diehard Celtics fan, knows this year’s Boston team won’t go down without an intense fight. Boston refused to let Cleveland pull away with a large lead in Game 2, despite many electric alley-oops and sharp-shooting from LeBron James (30 points, nine rebounds and seven assists), Kyrie Irving (26 points, six assists and five rebounds), and Kevin Love (13 points, six rebounds and one impressive reverse alley-oop dunk on a pass from James). “I told J.R. Smith that I felt like Billy Hoyle in White Men Can’t Jump at the end when he caught the lob from Wesley Snipes,” said Love. However, James admits his play in Game 1 and 2 wasn’t nearly as sharp as it should be for the playoffs. Celtics point guard Isaiah Thomas, who continues to be a thorn in the Cavs’ side during the playoffs, scored 22 points for the second straight game and added seven assists off the bench. In order for Boston to have a good chance at defending home court, they’ll need to play suffocating defense and have more players on offense score points in bunches. Game 3, which is scheduled to tip off shortly after 7:00 pm ET on Thursday night, will be broadcast nationally on TNT.